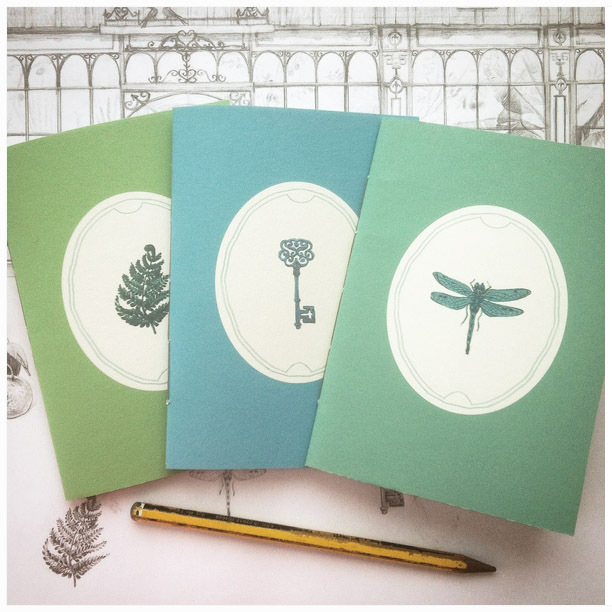 As I sit in my kitchen listening to the sound of rain against the windows, curling my hands around a well-deserved cup of tea, I contemplate the mental effort I have spent creating my first finished products. After all the drawing, editing, cutting, sewing - they suddenly all look like the smallest things imaginable. Yet off I have sent them, hand-in-hand, into the world. I had been reading about orangeries, the first greenhouses, and thinking about what they really meant in a time without pre-packaged food of every variety available at one's immediate whim. I'd wanted my products to be a little window into the old-fashioned and the curious, and so I started drawing the glowing view from inside and any little vintage assortments and oddments I could imagine there. What a marvelous space this must have been for those strange and stuffy Victorians. In a society living in both lavish excitement and pious suppression, how delicious this excess would have been for those blessed enough to enjoy them - hothouse flowers like the sensuous Orchid with its silky, pale-petaled forms, fruits from savage lands swollen into odd bulbous shapes of miraculous sweetness. A divinely pleasurable experience. 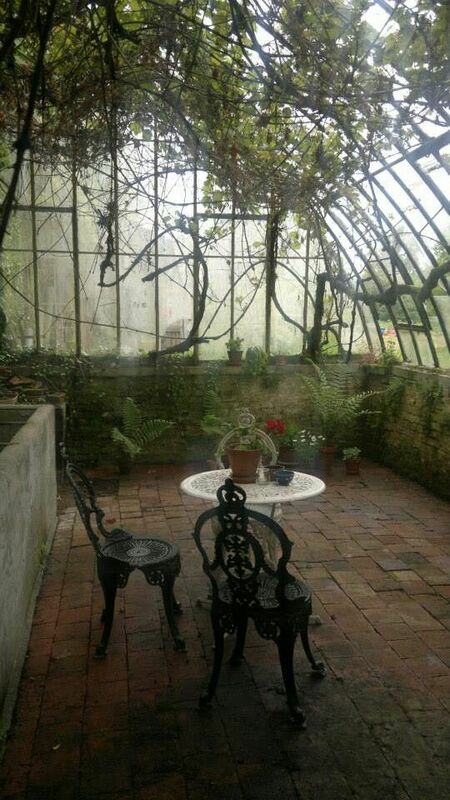 Ever since the seventeenth century, greenhouses and orangeries and conservatories in some form or another had been growing as an idea in the minds of the very wealthy. But, in those years of Empire, when the fruits of exploration were fast becoming seen as the birthright of Englishmen, they reached a new heady level of popularity. The advancement of technology in both glass-making and hot water plumbing meant that the heating of these plant houses could now be more successful, and accessible. Huge hothouses, such as the famous conservatories at Kew Gardens and the ill-fated Crystal Palace stood testament to everything that was optimistic and confident about the age. The world around them was ripe and ready to be plucked from the vine. Soon everyone wanted to have their hands on a part of these miracles of botany. 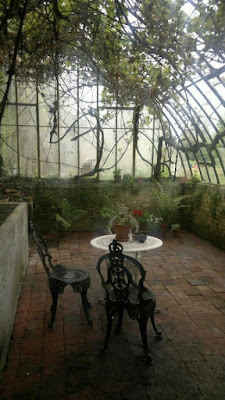 Private greenhouses, or "winter gardens", became a popular place for ladies to take tea. What better place to while away the afternoon than under the balmy warmth of your own private kingdom-in-miniature? 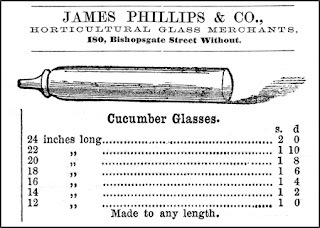 The humble cucumber earned its status within society's daintiest sandwiches as a result of the conserving power of these extraordinary glasshouses. And oddly enough, a perfectly straight cucumber became the very height of fashion. Cucumber straightener ad - How straight is your cucumber? Yes, we were certainly a precious bunch in the 1800s. But the Victorians have to be admired for their sheer tenacity and imagination. 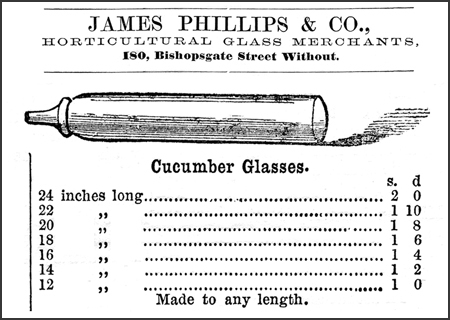 For when could we ever imagine a society accepting the cucumber straightener with such straight-faced earnestness? I hope you've enjoyed another little foray into our past. I fervently wish that you find something to summon up the warmth of the exotic on this most dreary of English days. Katherine O'Shea 2016 (c). Travel theme. Powered by Blogger.